It's so easy for us to get caught up in the latest product or health craze, especially in the complex world of gut health with a huge array of probiotics, prebiotics, bone broths, gut cleansing programs and protocols. It's so so confusing hey?! Scientific studies have shown that the bacteria we swallow everyday can actually lodge in the gut and trigger inflammatory bowel conditions like Crohn’s disease and ulcerative colitis. So why do we hear so little about oral health if so much of our gut health starts in the mouth? I don't know about you, but I personally want to start my day with fresh breath and be able to roll over, kiss my wife and actually feel confident about making love first thing in the morning. What better way to start the day? Get a Waterpik and never look back! 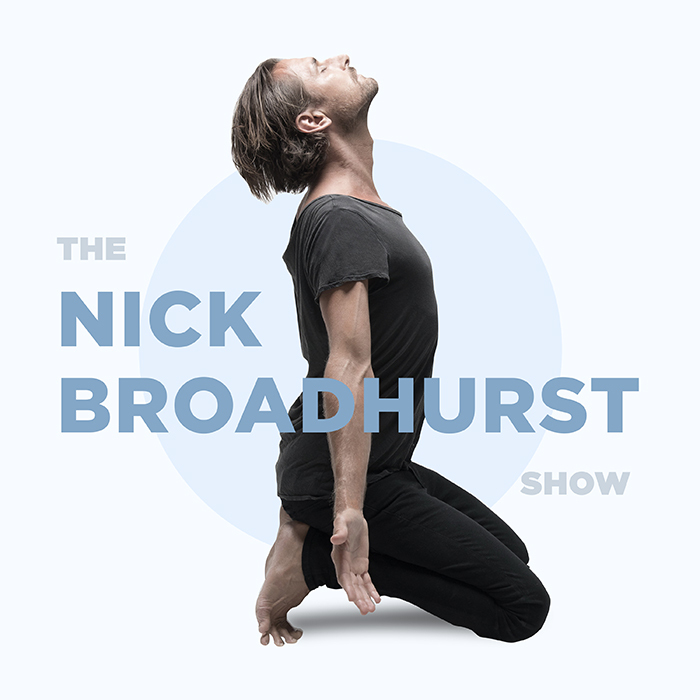 Welcome back to The Nick Broadhurst Show. I’m your host Nick Broadhurst, also known as Broadhurst in the music world. You can catch all of my music and music videos at iamnickbroadhurst.com. And if you listen to Spotify, please head to iamnickbroadhurst.com/spotify to catch all of my music. And you can now listen to this podcast on Spotify as well which is super cool. And that track you were listening to is a track called Status Quo. Hope you enjoyed it. And you can catch that at iamnickbroadhurst.com/statusquo. Now, onto the show. And this is a pretty interesting topic because I think it’s often overlooked. I think we get quite obsessed with the latest thing when it comes to health. And there are things which go back thousands and thousands of years which have been used to successfully improve people’s health. And a lot of these things are just super super easy. So, I want to talk to you today about gut health but from a slightly different perspective. Now when we talk about gut health, what’s the first thing we think about? We think about maybe Candida, maybe the use of probiotics, fermented foods, bone broth, these sorts of things. Now they all have their place of course, they’re all really really important, but when it comes to gut health it’s really, I think, quite dangerous sometimes to be using some of these products on the assumption that you’re doing the right thing. Because for example if you have bacterial overgrowth, which I have gone through in my life, in my humble opinion the last thing you want to be doing is throwing more bacteria in there. Which goes against all popular thinking around fermented foods, so I’ll let you guys do your own research on that. But even something as simple as bone broth can be really challenging for someone who doesn’t have good gut health because of the natural histamine content. So what I wanted to take to you about today was something a bit more simple, and that is looking at gut health from the perspective of the mouth, from oral hygiene. I think this is really really overlooked, and it’s so simple but trust me, it is really really powerful stuff. So I read recently that there was a big study that was published in Science journal, and it was by an international team of researchers, including someone from Harvard as well. And it reported on strains of oral bacteria that when swallowed in the one and a half liters of saliva that we all ingest every single day, these bacterias can actually lodge in the gut and trigger inflammatory bowel conditions like Crohn’s disease and ulcerative colitis. And it got me thinking, “Ok, well if that’s the case, shouldn’t we be taking care of the bacteria in our mouth? Shouldn’t we be taking better care of our oral hygiene?” Now just from a basic perspective, let’s just think about every morning when you wake up. Do you want to wake up with fresh breath or stinky breath? Now, for me I don’t know about you, but I want to wake up with fresh breath. And I have mastered this. And for me it’s important because how you start the day, like the first thing, if you wake up with a taste of something rancid in your mouth, I just don’t think that’s a very good way to start the day. Do you? No. Now, what if you want to roll over and talk to your loved one, talk up close, is that going to happen? What if you want to kiss your partner? What if you want to make love? Now, I talk a lot about making love in the morning because I believe there are very few ways to get the day off to a better start than making love, if you are lucky enough to have, or fortunate or worthy enough to have a beautiful partner in your life. But how are you going to do that if you’ve got stinky breath? Very very hard, right? So, I’m going to talk to you today about oral hygiene from an ayurvedic perspective and a [04:24 – inaudible] perspective, and some of the things that I’ve tried and I’ve got down to what I believe works really really well. Now as you may be aware, in Ayurveda there are 3 different doshas. There’s vata, pitta, and kapha. Now people relate to these mainly when it comes to body types. For example I have a vata, pitta constitution, but vata, pitta, and kapha also relate to different bodily functions, physiological functions in the body. Now when it comes to the mouth, there is a subtype of the kapha dosha which is called bodhaka kapha. And this is really really important in the mouth because it initiatives the first stages of digestion which control the digestion of simple carbohydrates via enzymes in the mouth, it regulates all bacteria, it supports immune function, specifically via the tonsils. Super super important. And it’s interesting in western medicine that some diseases that come from kapha sites in the body, such as the pancreas, the heart, the brain, and joints are actually directly correlated to the bodhaka kapha functions in the body, these kapha sites in the body. So it’s all we improve such as diabetes, which happens in the pancreas. So ultimately, when we care for our mouths properly, we support all of these deeper organs and tissues. I mean why is this not spoken about more? That’s what I’d love to know. And there are some people who do talk about it and there was a great podcast on the Melissa Ambrosini show, which you can check out around oral hygiene. But I want to talk to you about my power tips. And there’s one thing in here which I think is, actually two things which are my secret weapons. But first, the basics. When you wake up in the morning if you have any covering on your tongue, anything white, now this is called — or could be yellow, could be even dark grey sometimes, depends on the imbalance in the body, but any coating on the tongue is called Ama. Ama means basically undigested food essentially in Ayurveda. And in Ayurveda, undigested food according to these ancient medics was the cause of all disease. Now, we’re not talking about just physical food; undigested food in Ayurveda also relates to things like undigested thoughts which are also equally toxic in the body. But, you want to wake up in the morning and obviously remove that Ama. So, if we don’t do that, we’re going to carry those toxins around in our mouth all day, which is pretty gross. And if you think about it, the tongue is an extension of your digestive tract. It’s actually the very beginning of your digestive tract. So whatever you see on your tongue is like a mirror. It’s a mirror for you digestion and your digestive tract. So we want to get your digestion rocking and rolling, and good oral health is definitely a very very important way to start. So tongue scraping, you can get yourself a tongue scraper, they are very cheap. You can do that in the morning when you wake up and before bed. Simple, it’s that easy, tongue scraping. Highly recommended. Powerful detoxification tool. Super cheap. Been around for thousands of years. Absolutely essential. The next one is oil pulling. And oil pulling, I believe, is a bit controversial because of the massive claims that get made by various people about how miraculous oil pulling is. And I think the misconception comes from people saying that it pulls toxins from the body; and look, it might do that, but I don’t believe that it probably does pull toxins from the body such from tissues. What I believe, and this makes way more sense, is that it rids the mouth of bacteria. Now traditionally, you would use something like a cold pressed sesame oil in Ayurveda, but if you switch that to a coconut oil which is naturally anti-microbial, you’re actually going to do your mouth a massive favor and you’re going to remove a lot of bacteria which is going to help prevent plaque and help maintain a normal pH in the mouth. So I think oil pulling is absolutely incredible and I do it when I remember, probably a few times a week, but every morning would be great. And it’s just part of your daily oral hygiene routine. The next one is brushing your teeth. I know, that’s not a massive secret, but please throw away any toothpaste that you by from the supermarket, it’s absolute junk and it contains things like fluoride which we do not want; and some really gross foaming agents which are really toxic. So go to your health food shop and buy the most simple, clean toothpaste that you can find. And there’s heaps of good ones out there. Okay? Very simple. Or just Google how to make your own toothpaste on a website like Wellness Mama. She’s got some great recipes which we often make at home. Now the next one, this is one of my power tips. This is like my secret weapon and it is essential oils. Now, we use a specific essential oil called On Guard, which is made by the company doTERRA. And this is my favourite when it comes to oral hygiene, and in fact doTERRA is my favourite brand when it comes to oral health. You can learn more about essential oils at iamnickbroadhurst.com/oils. Now, there’s lots of oils which are great for oral hygiene, such as cinnamon, but the one I want to talk to you about today is called On Guard. It’s a blend and it’s this simple. Before bed I do one or two drops on my tongue with a small amount of water in my mouth, and I gargle it and swish it around my mouth for just a minute. That’s it. I guarantee that one thing, just one little trick, should make a massive difference. Now it does for me, personally, I wake up like the freshest freshest breath. I can go straight into intimacy with my wife with no concerns whatsoever, and my oral hygiene was pretty good before but this took it to a whole new level. I highly guarantee that you check it out. And the last secret weapon, and I can’t believe people don’t talk about this more often, it really sort of confuses me. But we talk about flossing, but there is a tool called a waterpik. Now my dad who was a dentist, he’s retired now, he has been using waterpiks and recommending them for probably 30 years. I remember using these as a teenager, so we’re going back 25 years, or probably more, maybe 30 years. Now, a waterpik is this simple, it’s a little machine that sprays a really fine, strong, stream of water in your mouth, and you can use it to floss with water between your teeth. I guarantee you, when you start using a water pick, and that’s “w-a-t-e-r-p-i-k”, one word, I guarantee you when you start using a waterpik, you will feel literally gross when you don’t use it anymore because it’s that good. Seriously, this is one of my secret weapons. So we actually have two waterpiks in our house, one in each bathroom, just to make sure we use it all the time, but we also travel with a portable waterpik everywhere we go. So that guys, those are my power tips for oral hygiene. As you can see, this is really important stuff, and as I said before, yes we can do a whole bunch of things for gut health, but digestion and gut health starts in the mouth. That is the first phase. So I hope you enjoyed that. I hope there’s some tips in there which you can employ in your life, and for all the show notes today you can go to iamnickbroadhurst.com/11 and you can now get a full transcript for the show, which is awesome. So if you’re reading, you want to read at work or in bed and you can’t listen to it, then by all means go and check out the transcript. And while I have you, I would love to hear from you and any thoughts you have on this podcast. Please do tag me on @IAmNickBroadhurst on any social media platforms. And use the hashtag #TheNickBroadhurstShow, so I can see your comment. Wow, Nick. I have just listened to this and now can’t wait to delve into your other podcasts! I was aware of tongue scraping through Melissa (which I do daily), but have never heard of waterpiks or OnGuard essential oil and will definitely check them out. It makes such a lot of sense! Love the bitesize podcasts. They are just perfect to listen to for a daily dose of inspiration. So we bought a Broadcare (thought that was an appropriate make!) waterpik here in England, and you are right..it’s great!! Only problem was my hubby got completely drenched the first time using it. I think a little practise is required!..